We are excited to feature Michael Godfrey, Sales and Leasing Consultant, as our Feature Friday interviewee this week. 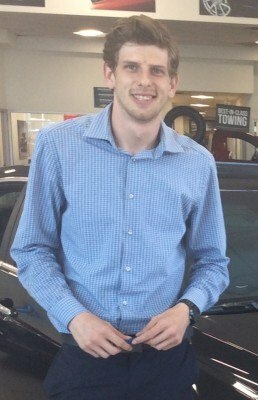 Please scroll down to read about Michael's take on life around the dealership. Ontario Motor Sales means a career to me. This is the place I want to establish myself at in order to grow and perfect my craft. OMS is the best GM dealership in Ontario in my opinion, from our vast inventory to our huge service department, to the great things we offer like OMS Direct and courtesy transportation. We are not only the largest GM dealership in Ontario but we offer the most, and we have the best business practices. My favourite part about working here is the reputation. OMS has one of the best reputations for a dealership that I’ve ever seen. Every customer who does business with us is happy, and all comments or concerns are dealt with promptly and reflect the attitude and respect we have here at OMS. Working at such a respected dealer is great because there is already a level of trust we have earned from the community and that’s something I’m honoured to now represent. One thing I try to bring to interactions with my customers is care, whether it's caring about you, caring about your problems, or caring about how I can help. My objective is to shed the image that many people have of our industry. For years, car sales has been an industry labeled as untrustworthy, which in the past may have sometimes been a correct assumption. This may still be what some people think, but it truly is not the case here at OMS, and with myself in particular. I strive to become not just your salesperson who you bought one car from, but your friend in the car business who is here to help with any and every vehicle problem you may have. OMS supports me in doing just that. I would describe the working environment here as professional. We are by the book, we are honest and upfront, and we really go the extra mile for every one of our customers no matter if they are new purchasers or existing customers. Whether you’re in for anything from a new car to an oil change, you will be treated with the same respect and etiquette. Being a huge vehicle enthusiast, my most interesting story from OMS is probably the 2016 Corvette show we held here on June 26th. From Corvettes to Camaros to Trucks and Pontiacs, there was a lot of history here from years dating back to 1950! It was very interesting to see the generations of GM enthusiasm, and all the beautiful projects that I had no idea existed. I think that community involvement is important in any industry, and I think the way we get involved is great. I am 22 years old, and have only been at Ontario Motor Sales for 3 months, but I already know that this is where I want to retire from. Great cars, great people, and great service.